During Good Foods Market & Cafe's celebration of Eat Local Month last July, Alison Baker and Paul Haney of Long View Organics in Springfield, Kentucky, offered tastes of their microgreens and a tutorial on why the tiny green leaves and stems are not sprouts. I munched the samples, listened, asked questions. Paul (raised in Lima, Ohio— so did he have any choice other than to make a living in food?) explained that microgreens grow in soil or something like it. Sprouts, on the other hands, live their short lives in water or watery conditions. Because microgreens grow with their feet in soil, they take up some trace minerals not available to sprouts. More important to me, soil as a growing medium reduces worry that the greens will carry the kinds of nasty pathogens that sometimes infest sprouts. At prices ranging from $4.99 to $13 per OUNCE, microgreens seem mega-expensive to me, given that growing greens in our own gardens is easy during much of the year in Kentucky, and given that microgreens apparently have no nutritive advantages over larger, less expensive fresh greens. Turned on its head, though, the retail price for microgreens could make them a good candidate for Kentucky growers looking to boost farm income. Would more growers mean a bigger market, and more farm income, or would more growers lower retail prices, making microgreens less good for farm income and more accessible to us home cooks? And do they offer such distinctive tastes that we will embrace them in spite of price? 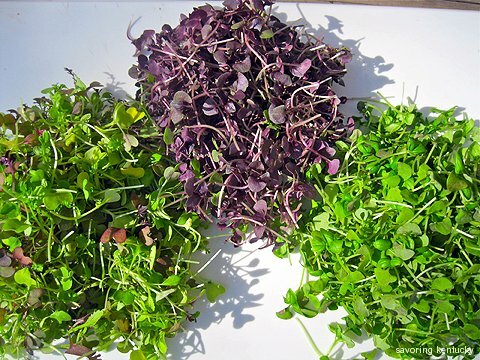 I tasted four types of Long View Organic microgreens: mild mix, spicy mix, purple basil, and green basil. In addition, because my party talked about microgreens during a recent working lunch at delightful Holly Hill Inn, Chef Ouita Michel offered us all tastes of radish microgreens and, for contrast, mixed sprouts and pea shoots, all grown in Kentucky. I like the microgreens much the best because of their tenderness and mild flavor. The basil micro-greens are particularly delicious—basil without any bite. I am intrigued by the promise of tasting micro-mint, kale, sorrel, and arugula, since those are among my favorite tastes. Micro-greens had their moment in the national food spotlight. David Sasuga, of California-based Fresh Origins, reports micro-greens were an NPR culinary buzz word in 2008, and the number 5 produce trend among chefs in 2009, according to a National Restaurant Association poll. Now, thanks to Long View's hard work, knowledge, and delivery to central Kentucky (and perhaps other parts), we Kentucky home cooks get a chance to try adding them to salads, sprinkling on breakfast omelettes, and using them to adorn plates. We'll see what happens. I can say for sure that microgreens appeal to microhumans. I watched several children beg for tastes during my short interview with Paul and Alison at Good Foods. If children forgive mild-flavored microgreens for being green and eat them anyway, that could make a big difference, adding microgreens permanently to many health-conscious Kentucky families' tables. Isn't "Browning's" a Perfect Name for a True Kentucky Ham and Bacon Company?